Welcome to Saplings Stay and Play! Saplings is for parents and carers with children and babies (0-4 years). We meet every Friday 9.30 to 11.30am during school term time. 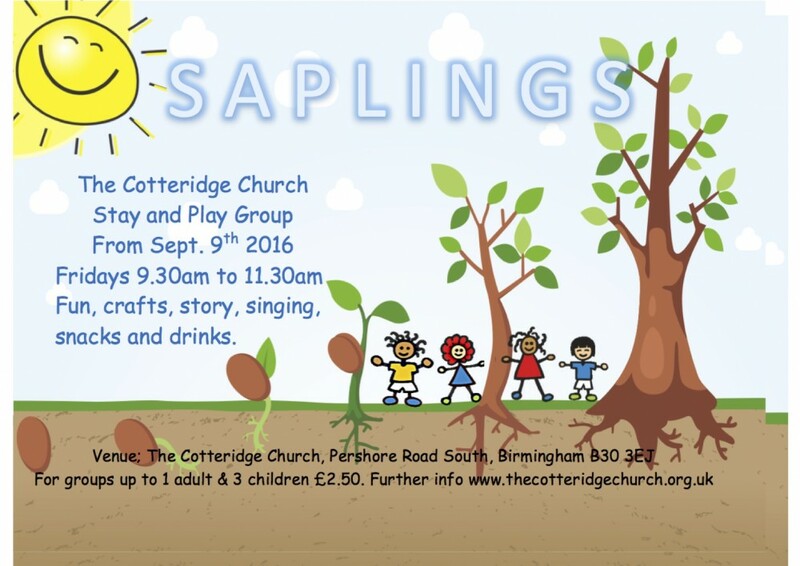 Saplings is run by a group of volunteers from The Cotteridge Church. The cost is £2.50 per family group to cover the cost of craft materials, drinks and snacks. We aim to provide fun, friendship and support for each other, as parents and carers along with positive educational play experiences for children, in a safe environment. A warm welcome is awaiting you and we hope you enjoy the friendly group and have fun. Here is our session at a glance. We have a soft area for under 1’s with a baby gym and toys. Free play includes role play, home corner, dressing up, construction toys, dolls, cars, ride on toys, book corner and table top activities such as play dough, jigsaws, colouring, collage and threading. We always have 2 craft activities such as painting, sticking, printing, icing biscuits or planting. At 10.15 we have snacks and drinks for both children and parents. We finish our sessions by all coming together for singing, a story time and thought for the day. The Cotteridge Church has toilets and nappy changing facilities, and we request all carers to make use of these in the interest of hygiene. Buggies and prams can be brought into the Malvern Room and stored safely. We can warm bottles in the kitchen on request and we welcome breast feeding. We are in the centre of Cotteridge with good bus links and very close to Kings Norton railway station. When arriving at the church please come through the main entrance and café. We meet in the spacious Malvern Room which is our main worship area. You will find it suitably kitted out with toys and activities for all ages. Click here for more details.